Racing Club Warwick boss Scott Easterlow has a lot to be happy about despite their FA Vase exit. Racing Club Warwick boss Scott Easterlow is determined to build on the momentum created by his side’s run to the third round of the FA Vase. Racers bowed out of the competition on Saturday after a 2-0 defeat to United Counties League Premier Division outfit Wisbech Town, with Easterlow admitting the visitors were worthy winners. “All you can ask for is to get what you rightfully deserve on the day and I don’t think on the whole balance of play we deserved the win,” he said, despite seeing his side spurn several clearcut chances. However, with Racing Club’s cup run going hand in hand with a rise up the table to see them crowned Midland League Team of the Month for November, Easterlow said there is a real feelgood factor around Townsend Meadow. “The lads can be proud. No one expected us to get this far - we were one of the lowest ranked sides left in it. “People forget this is a completely new side I have built at Racing and the first time some have played at this level. “We will only get better. “The lads will have learnt some lessons from Saturday against some experienced non-league players. 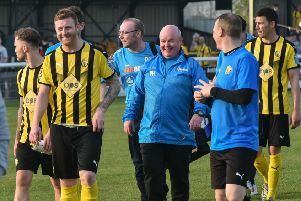 “The one who impressed me for them was Michael Frew who played against Middlesbrough when Nuneaton famously reached the FA Cup third round in 2006. “Everything is going to plan in my first season in charge. “We have the best in local talent at the club in my opinion now which was always one of the club’s aims when I took over. “We also wanted to get the gates up and we have seen them rise significantly as well with 300 watching last Saturday when last year they averaged 20 to 30. “So as much as being out of the Vase is upsetting, it’s still a great time to be at Racing Club Warwick. Racing Club bounced back from their Vase exit with a 6-2 win over Black Country Rangers in the Birmingham Midweek Floodlit Cup on Tuesday night.